Region: This mealybug can be found in southern United States and California. Life cycle: This insect produces two to three generations each year and overwinters as an egg. 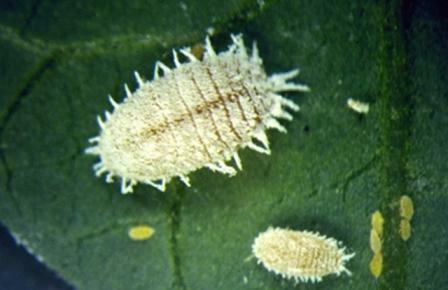 Physical Description: The 1/10 inch long mealybug is light yellow, short, filaments of equal length around its body, and is covered with white powder. Feeding characteristics: This pest attacks citrus, avocado, and potato plants. Both the adults and nymphs feed on cell sap, or juices, in twigs and foliage, causing eventual death of the affected parts after they wilt and lose their color. The mealybug coats the foliage with thick honeydew, which is a growing medium for black mold. Honeydew is also a food for ants, which end up carrying the mealybugs from plant to plant. Controls: Your first actions should be to eliminate ants around the plants. You can spread bone meal on the ground to accomplish this, or wrap tree bases with cloth, and apply Tanglefoot. You can buy a mealybug predator, Cryptolaemus montrouzieri, more commonly known as Mealybug Destroyer. Place ten destroyers on each tree on a calm morning or evening. One release should be enough for an entire season. For plants that won't be damaged by frequent watering, spray with a forceful jet of water, or soapy water. Rotenone and pyrethrum are also effective botanicals against this pest.